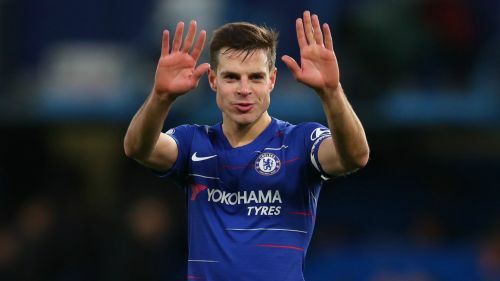 Cesar Azpilicueta says Chelsea will "give everything" to turn their fortunes around under Maurizio Sarri as their season enters a potentially decisive phase. Pressure is mounting on the head coach after a difficult run of results and there were boos around Stamford Bridge at the full-time whistle of Monday's 2-0 FA Cup defeat to Manchester United. The Blues take on Malmo in the second leg of their Europa League last-32 tie on Thursday and are heavy favourites to progress, having claimed a 2-1 win in Sweden last week. However, that match takes place just three days before the EFL Cup final showdown with Manchester City, who thrashed Chelsea 6-0 in the Premier League 10 days ago. There is talk that Sarri will not keep his job into next week if they do not manage two positive results, and Azpilicueta insists the players will fight to ensure they do. "It was a tough night because we didn't convert our game into chances, and we didn't score at least one goal to push us until the end, give us belief, bring the atmosphere up and fight until the end, so obviously we are disappointed," he told Chelsea TV after the United loss. "We are eliminated from the competition, we are the current holders and we reached the final the year before last as well. We know the history of the competition, for the country and the club as well. It's frustrating. "We know the fans support us in every moment. At Chelsea we are used to winning a lot of trophies and we have been the most successful team in England for the last couple of years. So, the only thing I can say is that we will give everything and work hard. "We know we have the Europa League game coming up on Thursday. We will then play a final when we are back at Wembley after the FA Cup final last year and the Community Shield. "We are used to fighting for trophies, so hopefully we can keep calm from Thursday and then win that trophy on Sunday."